After missing the pre-tournament trip to Portugal, Ireland pair Rob Kearney and Jack McGrath did their chances of making the opening Six Nations showdown with England few favours in a rusty display for Leinster. Both players have plenty of credit in the bank and are coming off lay-offs. 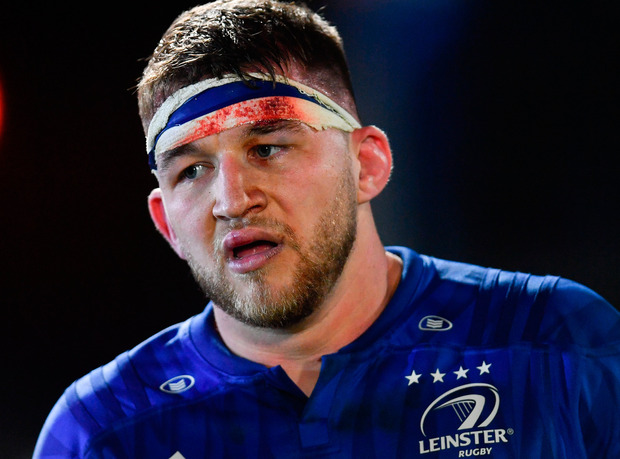 Last night was about getting some much needed match-minutes in the bank, but a man who values performance as much as Joe Schmidt won't be happy with what he saw after returning from the Algarve. Twice in the first half, McGrath was left for dead and the covering Kearney missed the man, while after half-time the full-back's miss on Dan Davies led to Kieran Hardy's try and the Scarlets getting back into a scrappy game. It wasn't all bad, McGrath made a good strip tackle, scrummaged well and made an impressive line-break, while Kearney carried hard on a number of occasions but Leo Cullen would have wanted his senior players to provide more for the callow group around them. They came through unscathed at least, with McGrath clocking up 50 minutes and Kearney managing an hour. 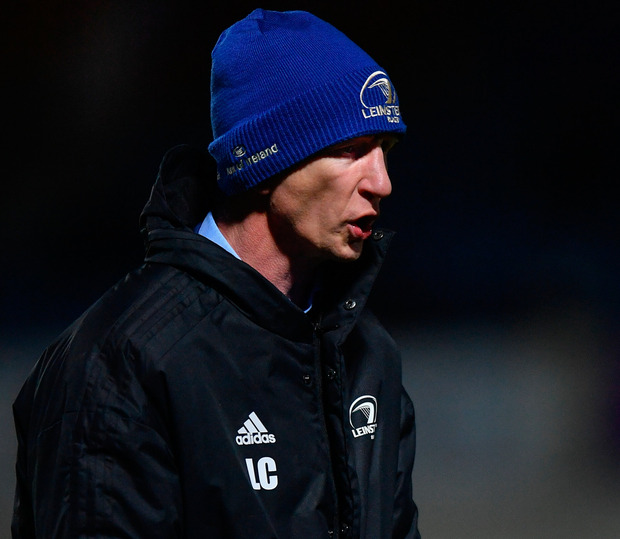 Instead, it was Caelan Doris and Conor O'Brien who impressed, with Rory O'Loughlin and James Tracy providing leadership as the Blues overcame a second-half revival to notch up their 12th PRO14 win and extend their lead at the top of Conference B to 21 points. 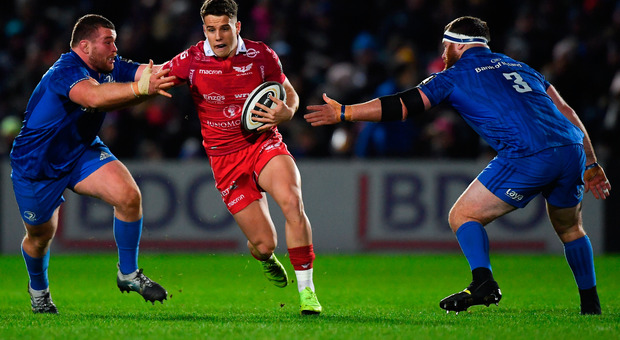 In truth, they rode their luck and Scarlets winger Paul Asquith won't have enjoyed the plane journey home after costing his team two second-half tries that would have turned their one-point haul into five. The Scarlets suffered an early blow when second-row David Bulbring suffered a serious-looking knee injury after just five minutes. Yet they made the early running and when James Lowe's loose pass handed them possession, scrum-half Hardy slipped past the two Ireland squad members McGrath and Kearney who needed Hugh O'Sullivan's tackle to bail them out. When the Scarlets went wide, out-half Ciarán Frawley brilliantly got over the ball and won a penalty. The attacks kept coming and again McGrath and Kearney were left in Johnny McNicholl's wake, this time O'Sullivan couldn't make the tackle and the scrambling Tracy saved the day. This was a rare occasion where the men in blue failed to protect the ball and, as a result, they were forced to make tackles. 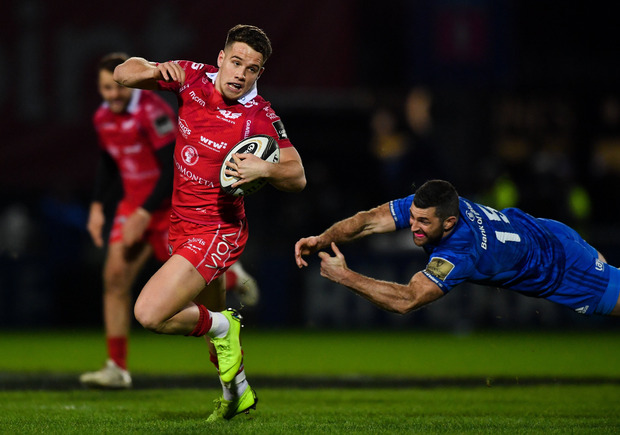 The problem was they missed far too many of them and it was fortunate that Scarlets coughed up the ball as they probed the Leinster rearguard. Having somehow made it to 29 minutes without conceding a try, the home side finally managed a spell of possession and left the 22 with the first score of the game. It started with a strong carry from Doris carry and a Rob Kearney half-break, then McGrath raced through a gap and Lowe continued the surge. The 16 phases didn't produce a try, but Josh MacLeod was penalised for hands in the ruck and Frawley nailed the penalty. 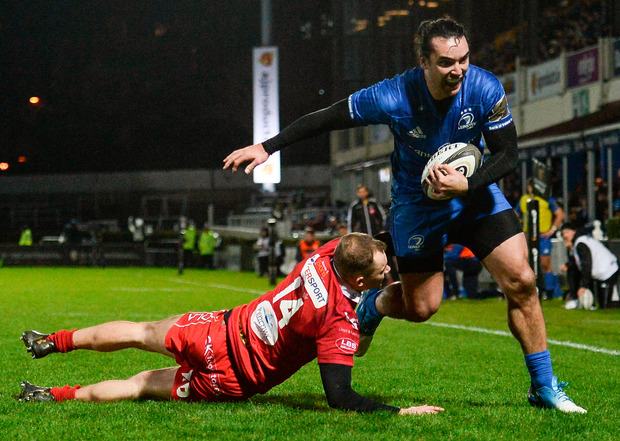 Rory O'Loughlin snuffed out the Scarlets' attempt at a response and instead it was Leinster who finished the half on the front-foot. O'Brien made a searing break into the Welsh side's 22, O'Sullivan's chip forced McNicholl to carry into touch. The defensive maul infringed at the first Leinster attempt and they accepted the second invitation as O'Brien made the best of an untidy Mick Kearney pass and his centre partner did brilliantly to fight through the cover and touch down. Frawley made it 10-0 at the interval and that lead appeared to last less than a minute of the second half as Asquith picked off the young Leinster out-half's pass, raced home but somehow contrived to knock on while grounding. Dan Jones missed a kick from right in front as things went to bad for worse for the visitors, but they finally got the try their play deserved on 53 minutes. And it was one to forget for Kearney who found himself face to face with openside Dan Davis and was left for dead as the youngster drew Jamison Gibson-Park and put Hardy over. This time Jones made the kick and added a penalty to level matters. Leinster re-took the lead as Lowe was held up over the line and then scored off the resulting scrum, taking Gibson-Park's pass and powering through Ioan Nicholas' tackle to score. Frawley missed the conversion, but Leinster gave themselves some breathing space as Vakh Abdaladze made a huge carry and Noel Reid chipped in behind for the impressive Barry Daly to score. This time the out-half added the extras. The hosts were under their own posts again with five to go when McNicholl slipped past Ross Molony and found Hardy on his shoulder and the lively scrum-half scored again. Jones converted and the visitors went looking for a winner. It should have come when Asquith broke the line, but he failed draw the last man and his tired pass to Hardy went to deck. The full-time whistle soon followed much to Leinster's relief. Leinster - R Kearney (capt) (R Kearney 61); B Daly, R O'Loughlin, C O'Brien, J Lowe; C Frawley, H O'Sullivan (J Gibson-Park 50); J McGrath (E Byrne 50), J Tracy (B Byrne 61), M Bent (V Abdaladze 71); R Molony, M Kearney (O Dowling 61); M Deegan, S Penny, C Doris. Scarlets - J McNicholl; I Nicholas, K Fonotia, S Hughes (capt) (T Prydie 54), P Asquith; D Jones, K Hardy; P Price (D Evans 67), M Jones (D Hughes 67), W Kruger (S Gardiner 67); J Ball, D Bulbring (J Helps 6); T Price (E Kennedy 67), D Davis, J MacLeod.